Stoke City is famous for their long throw-ins attacking strategy. It is a different kind of attack for the defenders who get used to crosses. It is also a big question for the keepers whether they should stay at the goal line or not. There are some pieces which analyse Stoke’s performance. Is there any other team having the same strategy in English football? Northampton may be the team with similar (or even better) performance in long throw-ins. Considering the number of set play goals, Northampton scored the most set play goals (34 goals). The following table shows the open play and set play goals of 24 League 2 teams this season and highlights the top 5 teams in set play goals. They are AFC Wimbledon, Bradford, Cheltenham, Gillingham and Northampton. 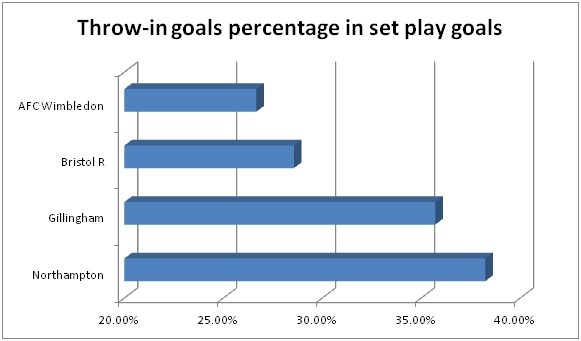 In order to analyse how important set play goals are to different teams, the percentage of set play goals were considered also. 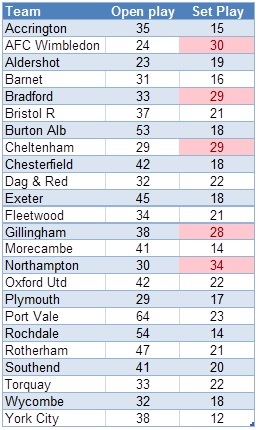 The following table shows the percentages of open play and set play goals of 24 League 2 teams this season. For example, being the League 2 Champion, Gillingham scored 28 set play goals but there were stronger in scoring open play goals. Therefore, set play goals only accounted for 42.4% of their total goals. 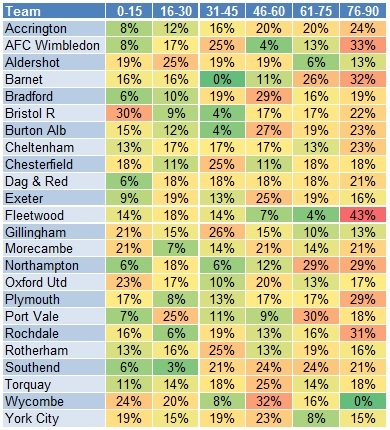 The top 5 teams with the highest percentage of set play goals were AFC Wimbledon, Aldershot, Bradford, Cheltenham and Northampton. Northampton is the 2nd place in set play goal percentage. 53.1% of their goals were set play goals. Comparing both tables to each other, we can identify that 4 teams existed in the top 5 positions in both tables. They are AFC Wimbledon, Bradford, Cheltenham and Northampton. That means these 4 teams were good at scoring set play goals and set play goals were more important to them. Note that Northampton and AFC Wimbledon are the only two teams scoring more set play goals than open play goals. This chart shows how strong Northampton was in throw-in goals. With most of the teams having 3 throw-in goals or less, Northampton scored 13 throw-in goals this season. They scored 100% more than the 4th place Bristol Rovers having 6 throw-in goals. The great difference shows that scoring throw-in goals was a strong weapon of Northampton while most of the teams didn’t have the ability to do so. If we consider how important throw-in goals are within set play goals, Northampton is still the team showing the highest percentage. 38.24% of their set play goals were throw-in goals. It showed how important throw-in goals were to Northampton. 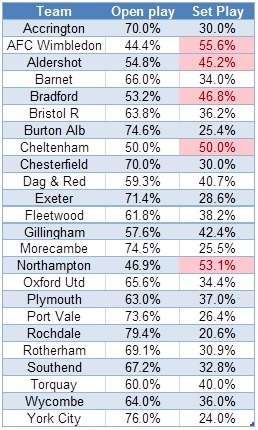 In fact, Gillingham and Northampton were the only 2 teams with more than 30% of their set play goals as throw-in goals. Considering only 9 teams in the league having more than 10% of their set play goals as throw-in goals, it shows how Northampton outperformed other teams by having 38.24%. No matter we consider the number of throw-in goals or the percentage of throw-in goals, Northampton is still the best team in the league and they obviously outperformed other teams in the league. I don’t have the goal scoring data of Stoke City this season. However, I wonder Stoke City can achieve the two conditions of Northampton or not. In part 2, the focus will be analysing the details of Northampton’s throw-in goals. It includes when they scored, how they scored, where they scored, where the assists came from, etc. The analysis is continued following the first part last week (here). In the shot analysis, when treating unequal frequencies of starting appearances, the data are “normalised” by dividing the data by the frequency of starting appearances. Although the other three strikers have at least 2.5 shots per appearance, T Pope had only 1.83 shots per appearance which is significantly lower than others. 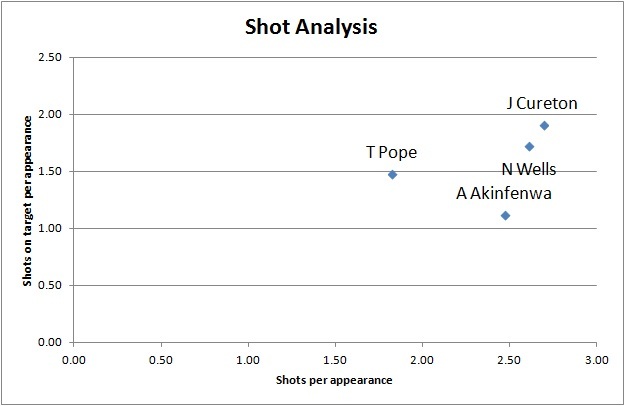 In terms of getting shot chances, T Pope is weaker than the other three strikers. On the other hand, A Akinfenwa showed his weakness as he only got 1.12 shots on target per appearance. N Wells and J Cureton are similar, both getting high number in shots and shots on target. Even T Pope got less chance to shoot; he still managed to get 1.48 shots on target which means he utilise the chances well. If you look at this chart only, you may wonder why T Pope is the leading goal scorer in League 2. It is all because he is particularly strong at catching the chances even the chances he get are less than others. This brings us to the next analysis chart: Accuracy rate vs Conversion rate. T Pope is outperforming others in this chart in both rates. 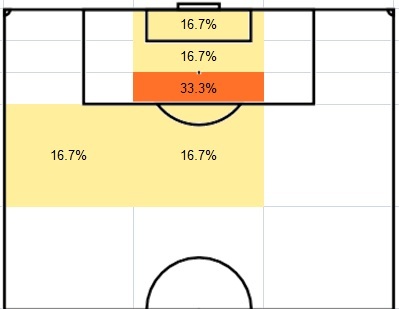 In previous chart, N Wells and J Cureton showed they got more chances to shoot and they did well in number of shots on target. It is reflected in their decent accuracy rate (66% and 71%). However, conversion rate is their weakness (26%) and it explains why they can’t be the leading goal scorer even they got more chances. T Pope’s conversion rate (48%) is 22% more than them. 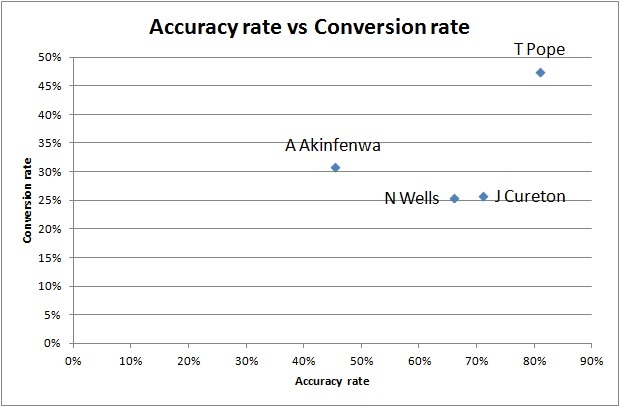 A Akinfenwa did well in conversion rate (31%) but he is weak at accuracy rate (45%). From the above two charts, you may realise N Wells and J Cureton are so similar. They both good at getting shooting chance, have a decent accuracy rate but weak at converting chances into goals. T Pope is another type of striker who is highly efficient. A Akinfenwa strike a balance between both types. In analysing where the strikers scored, we can find out other characteristics of the strikers. A Akinfenwa is weak at long shot because only 8% of his goals were scored outside 12 yards from the goal line. It is reasonable if we combine the finding last week suggesting that he is strong at scoring by headers and in set play. N Wells is strong at scoring in 6-yard box (67%). Last week, we found out that he hasn’t scored any goal by header. If we combine both together, I guess that his goal scoring style is like “poacher” to catch the chances in 6-yard box by using his agility rather than strength. T Pope and J Cureton had a good balance in goal scoring area with T Pope stronger at 6-yard box and J Cureton stronger at 12-18 yard area. This chart fits our finding beforehand. A Akinfenwa is strong at heading and he scored 92% of his goals within 12-yard area from goal. It is reasonable to see that he scored all goals by using 2 touches or less. N Wells fits his “poacher” style by scoring all his goals using 2 touches or less. In terms of using 3 touches or more, T Pope had the highest percentage (20%). If we combine our finding of his high conversion and accuracy rate, it can somehow show his composure in front of the goal by getting the best chance to score. We can find out the strikers’ particular goal scoring pattern by using time analysis. Firstly, A Akinfenwa is much stronger in second half, only 31% of his goals were scored in the first half. Note that 46% of his goals were scored in the last 30 minutes of the game. This may be explained by his strength and strong header to attack at the end of the game. N Wells haven’t scored any goal in the last 15 minutes of the game. It is reasonable if we sum up the previous findings. Usually there will be direct style and long ball in the last 10-15 minutes if a team is losing, but N Wells is not the same type of striker like A Akinfenwa. N Wells is strong at feet and agility rather than header and strength. T Pope’s goal scoring pattern is interesting. 70% of his goals were scored in the mid 15 minutes of the halves. Only 5% of goals were scored in the first 15 minutes of the halves. He may need time to “warm up” in the game before showing his goal scoring power. Then we move on to the assist analysis to see how the strikers’ goals were assisted. J Cureton is stronger than others in dribbling which can create the scoring chance himself. A Akinfenwa and N Wells have no dribbling goals, that means they heavily rely on the support from teammates because they can’t create chances themselves. It is reasonable if we refer back to the characteristics of these two strikers. N Wells is strong at scoring in rebounds because 25% of his goals were assisted by teammates’ shots. It fits his “poacher” style mentioned above. Moreover, none of his goals were come from crossing. Surprisingly, only 20% of T Pope’s goals were assisted by passing. He relied on crossing (40%) more than other strikers. Then we analysed where the assists were. Please note that only open play goals assists were shown in the following diagrams. As I mentioned last week, A Akinfenwa is strong at headers and set play. This diagram shows that his headers goals were heavily linked to set play. Therefore, only 40% of open play goals assists were from the flanks. J Cureton’s goals were mainly assisted from the right flank and centre. 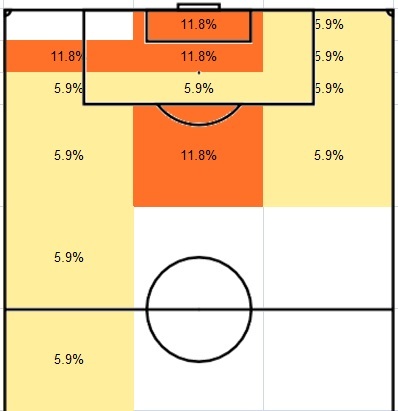 If any team play against Exeter, they should pay more attention to defending at their left flank (particularly from 12 yard to outside the penalty area) because 35.7% of J Cureton’s goals were assisted from these two zones. 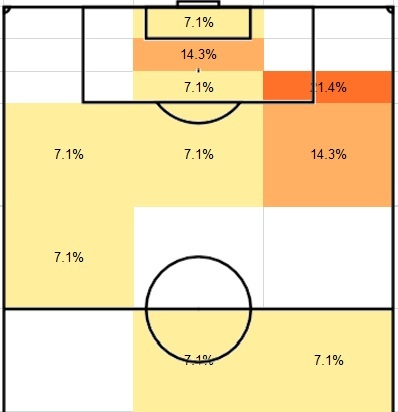 We can figure out a full picture how he scored open play goals: his teammates attack through middle of the pitch, making a pass or take a shot (particularly 12-18 yard area). If it is a pass, he would at most take one touch before the shot. If it is a shot, he would take the rebounding chance in the 6-yard box. From last week’s finding, T Pope is an all-round striker. He is good at scoring by right foot, left foot and header as well. 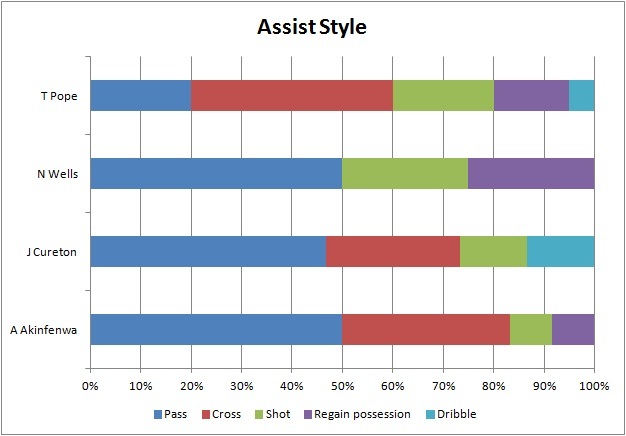 Even in this assist diagram, the assists covered a wide range of areas. These make defending the leading goal scorer a difficult task. However, it is still a useful tip to find out that 41.3% of assists came from centre. I think the whole analysis process covers enough details to find out the characteristics of the strikers. This is the end of the striker analysis. I may make a review about striker analysis at the end of the season. Different strikers have their own characteristics in scoring goals. They can somehow reflect their teams’ goal scoring characteristics as well. We will focus on the top 4 goal scorers in League 2. The analysis is quite long so I divide it into two posts. The second part will be continued next week. The following table shows who they are, their team and the position in league table. Please note that all the data is updated to 28/12/2012. It seems that being a top team does not necessarily need a top goal scorer as only 2 of the top 4 strikers are playing for a team in the top 7 of the table which is the promotion playoff line. The other 2 strikers are playing for the teams in the mid-table position. However, I agree that a high quality striker can bring an average team into a top team. Although T Pope is the top goal scorer, he doesn’t have the highest percentage of team goals. 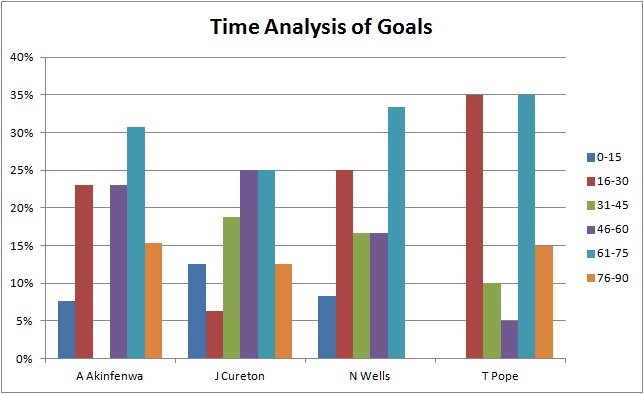 J Cureton is the striker whom the team relies on the most because he scored 47% of the team goals. It is worthy to note that all 4 strikers scored more than one-third of the team goals. Apart from looking at the number of goals, we should analyse by looking at the starting appearance as well in order to understand the efficiency of the strikers. As the top league goal scorer, T Pope is the most efficient striker as well. He scored 0.87 goals per starting appearance. Note that J Cureton scored more goals than A Akinfenwa but A Akinfenwa is more efficient because he scored slight more goals than J Cureton in terms of goals per starting appearance. We discussed how important the first goal before (here) so it is worthy to analyse the strikers’ ability to scored the first goal in the match. A Akinfenwa performed much better than other strikers in terms of first goal. 46% of his goals were first goal, which is obviously higher than that of T Pope (30%) and J Cureton (31%). His percentage of first goal is almost double the percentage of N Wells (25%). This is A Akinfenwa’s strength and people may ignore it if we don’t analyse the strikers from this perspective. Then we move on to analyse the relationship between open play and set play goals. T Pope (85%) and J Cureton (88%) scored most of their goals in open play, obviously higher than the percentage of other two strikers. N Wells struck a balance by scoring 50% open play goals. However, 25% of his goals were come from penalties. A Akinfenwa is particularly strong at scoring set play goals as 62% of his goals were from set play. Note than 31% of his goals were from throw-in which is much higher than other strikers. Moreover, he scored the highest percentage of goals in corner (15%) as well. He is a good example showing that the team top goal scorer can reflect the goal scoring characteristic of the team. Northampton scored more goals in set play (53%) than open play (47%). In all 18 set play goals, 50% of them were came from throw-in. The goal scoring pattern of Northampton and A Akinfenwa is almost the same even he scored only 35% of team goals. Then we will analyse how the strikers scored the goals. 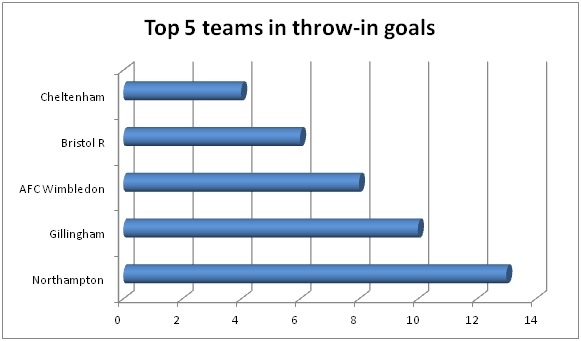 Note that I have excluded the goals from penalty in this chart. T Pope shows he is an all-round striker and this may explain why he is leading goal scoring table. The goals he scored by using his right foot (35%), left foot (30%) and head (35%) were almost evenly distributed. J Cureton is particularly strong at scoring goals by right foot (80%). However, it can be treated as a weakness as well because it is easier for the defender to mark him. N Wells is weak at header as he hasn’t scored any goal by header. However, he is strong at scoring goals by using both feet. A Akinfenwa is strong in air as he scored 58% of his goals by head. It fits what we find that he scored the highest percentage of goals from set play (62%) among 4 strikers, particularly in throw-in (31%) and corner (15%). In short, scoring goals by header in set play is the strongest weapon of A Akinfenwa. The analysis will be continued next week by analysing these 4 strikers from different perspectives including where they scored, when they scored, where assist came from, assist types, shots total and shots on target. League 2: How do teams score the first goal? Last time, I wrote about the importance of the first goal (here). 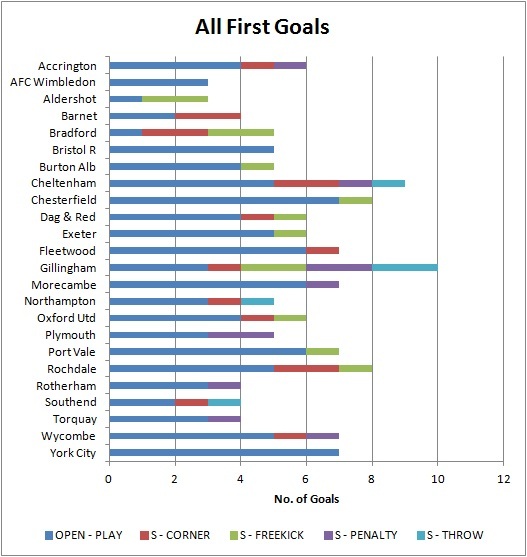 We know how important the first goal is, so the next question is “How can we score it?” Therefore, we will look at how the league 2 teams score their first goals. If you search in the internet, it is not difficult to find some findings about the general goal statistics. However, most of the goals were scored in different backgrounds and situations. Only the first goals are scored under the same circumstances: 0 – 0. Therefore, I think it is meaningful to look at the first goal statistics because it reflects the ability of teams to break the 0 – 0 situation. Please note that all the data of goals and league positions were updated to 22/10/2012. 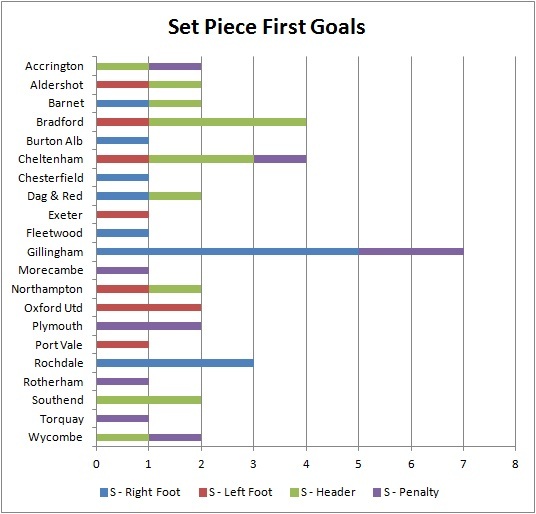 At least 50% of first goals were scored in open play in most teams except Aldershot, Bradford and Gillingham. Only 20% of first goals of Bradford were came from open play. Gillingham, which is leading the league, shows how strong they are in this chart. Not only they scored more first goals than the rest of the league, the more important point is they showed that they can score first goal in different ways (the only team which scored first goals in all five categories). They get both quantity and variety of first goals. Cheltenham is the second best. They scored 9 first goals in four categories. AFC Wimbledon, Bristol Rovers and York City scored all their first goals in open play. If you are play against them, it may be a good idea to be more aggressive in tackling to interrupt their open play because they are weak at scoring the first goal in set piece. If we look at the best 4 teams in this chart (Gillingham, Cheltenham, Chesterfield and Rochdale). Their league positions are 1st, 4th, 13th and 8th. I argue that strong at scoring first goal will bring teams to the top half of the table. However, it also depends on how good the team can retain their winning position. This topic was discussed last time. Then we focus on the open play goals first. The following chart shows how the teams scored the first goals in open play. Aldershot and Bradford are struggling in scoring open play first goal by scoring just once. However, it is worthy to note that Aldershot is in 23th and Bradford City is in 5th position. Barnet and Southend are the second worst by scoring 2 open play first goals. Barnet is in 24th and Southend is in 11th position. I argue that weak at scoring open play first goal will bring the teams to bottom zone but it is interesting to find out what Bradford and Southend did to bring them a decent league position. 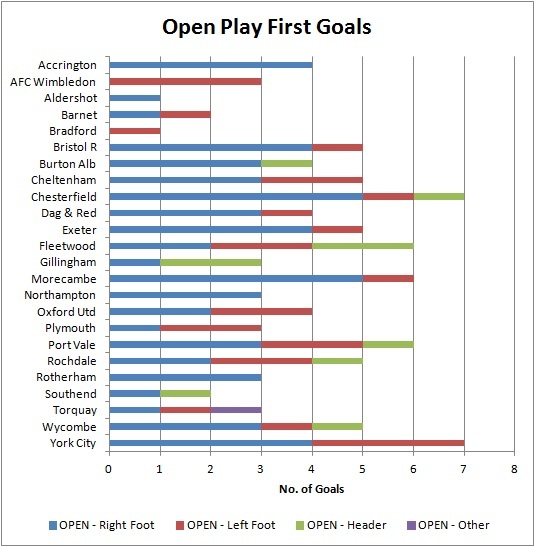 AFC Wimbledon and York City scored the most open play first goal by left foot. If we look at the best 5 teams in this chart (Chesterfield, York City, Fleetwood, Morecambe and Port Vale). Their positions are 13th, 12th, 3nd, 14th and 2nd). Only 2 out of 5 teams are in the first 7 positions which is playoff zone. I argue that strong at scoring open play first goal will bring the team to a mid table position at least but not enough to be the top 7 positions. Only 8 teams had scored open play first goals by header. 6 out of 8 teams are in the top half of the table. Gillingham and Fleetwood are the best and they are in the top 3 position in the league table. I argue that there is a relationship between them. The following chart shows how the teams scored the first goals in set piece. Most of the teams scored 1 or 2 set piece first goal. Gillingham is overwhelming in this chart, performing much better than the rest of the league. Interestingly, there is no header and left foot goal within those 7 goals. Scoring set piece first goal is a strong weapon of Gillingham to be the leader of the league. Bradford is the strongest team in scoring by headers in set piece first goal. 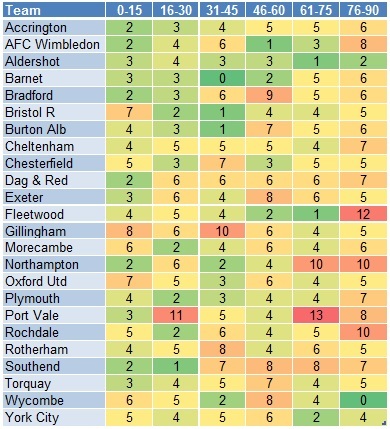 If we look at the best 4 teams in this chart (Gillingham, Bradford, Cheltenham and Rochdale). Their league positions are 1st, 5th, 4nd and 8nd). All of them are in top half of the table. 3 out of 4 teams are in the top 7 positions which is playoff zone. I argue that strong at scoring set piece first goal will bring the team to the top 7 positions. Scoring first goal is not everything, it is also important to retain the winning position which was discussed in the last article (here).